Wherever Jesus went, He carried within His heart the sense that His Father was always with Him. 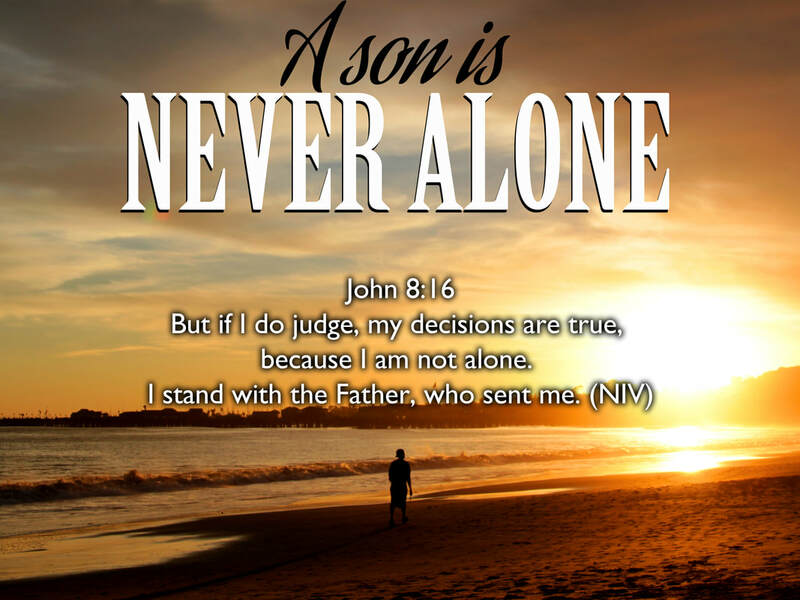 In this week's Scripture passage from the gospel of John, we read how Jesus was fully aware that He was standing side by side with the Father in every decision He made. If we struggle to believe that God really is with us as He promised, then we will feel a real sense of being all on our own in this life. I don't know how you feel, but as far as I am concerned, the world is a scary place to live if we have to figure out life all by our self! But the truth is that we are NOT alone! We have been sealed with the promised Holy Spirit as a deposit to guarantee our inheritance! (2 Corinthians 1:22) and we have been forever joined with Jesus as He declared in John 17:23... I in them, you in me Father! The glorious truth of the gospel is that the omnipresent, omniscient and omnipotent God is closer than we could possibly imagine! Because of the finished work of Jesus Christ, each one of us gets to host the abiding presence of God in our own bodies (1 Corinthians 3:16)... forever! So if you are feeling isolated and alone today by circumstances beyond your control, my prayer for you is that you would become more aware of your union with the One who is an ever present help in times of trouble (Psalm 46:1). The God who has promised to 'put the lonely in families' (Psalm 68:6) has now placed you in the biggest, best family in the universe (Ephesians 3:14-15). My prayer today is that you would know the tangible, abiding, brooding presence of God in and around you. May you feel the comfort of Father's love (2 Corinthians 1:3-4) and His closeness especially in times when you are crushed in spirit and brokenhearted (Psalm 34:18). The Most High will never leave you or forsake you (Hebrews 13:5) no matter what happens in your life. He is with you in good days, bad days and every day in between! So as you go about your daily routine today, may you do so with the glorious awareness that you are not alone! God the Father, God the Son, and God the Holy Spirit have forever, joined themselves to you! It was God's eternal intent that you would never feel isolated or separated from the community of love that finds its source in His heart.